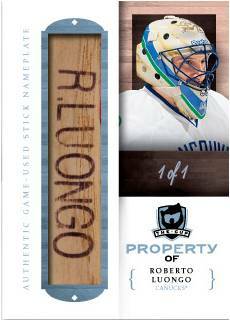 The Cadillac of hockey cards returns with the summer release of 2010-11 The Cup Hockey from Upper Deck. Featuring two autographed patch cards in every single-pack box, this ultra high-end set isn't for the weak of heart. As in past years, the draw is the extremely limited and unique content, all of which is very high quality. Don't expect to find a lot of single-swatch cards with plain jerseys. Instead, the set is loaded with patches and swatches from small jersey spots like fight straps and laundry tags. The Cup is scheduled for a mid-August release. All base cards numbered out of 249. Base set parallels: Gold Spectrum (/25), Black (/1). Base set variations: Jersey (/25), Patch (/10), Patch (/1), Tag Patch with Canadian Flag (/1), Autograph (/1). Autographed Rookie Patch Cards inserted one per pack: Level 1 (/99), Level 2 (/249). Gold Rainbow parallels limited to player's jersey number. Autographed Rookie Gear (/25) book cards include fight strap, jersey, patch and tag swatches. Autographed Draft Board and Patch (/10) book cards. Autographed Rookie Bookmarks (/25) match two first-year players on a book card with both dual swatches and two autographs. Scripted Swatches pair superstar autographs and patches. Single (/35) and dual (/15) versions available. Canada's national hockey program is arguably the best in the world. Programme of Excellence bring autographs from some of the best to wear the maple leaf. Single (/10) and dual (/5) versions available. Limited Logos (/50) include both an autograph and an over-sized patch swatch. Property Of... (/1) embeds player nameplates directly on the card. 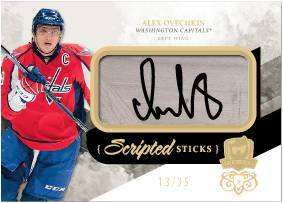 Scripted Sticks (/35) have autographs on game-used stick pieces. 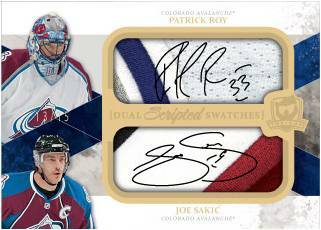 Dual Autographed NHL Shields (/1) are two-sided cards that include two full NHL jersey logos and player signatures. 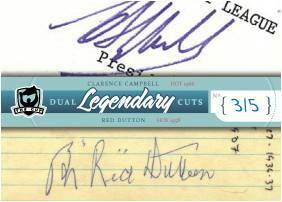 Cut signatures are included in both Legendary Cuts and Legendary Dual Cuts. Press plates included with both Autographed Rookie Masterpiece and The Cup Masterpiece. Artist Proof Redemptions inserted for uncut sheets. Signature Patches (/75), Signature Patches SP (/35) and Dual Signature Patches (/35). Honorable Numbers (numbered to the player's jersey number). Autographed Cup Foundations Quadruple Patches (/5). Stanley Cup Signatures (/50), Dual Stanley Cup Signatures (/25), Triple Stanley Cup Signatures (/10). Autographed Rookie Draft Boards (/25). Cup Enshrinements (/50), Cup Enshrinements Duals (/35), Cup Enshrinements Triples (/15). Cup Foundations Quadruple Jerseys (/25), Cup Foundations Quadruple Patches (/10), Autographed Cup Foundations Quadruple Jerseys (/15). Cup Trios Jerseys (/25), Cup Quads Jersey (/10), Cup Trios Patch (/10), Cup Quads Patch (/5).